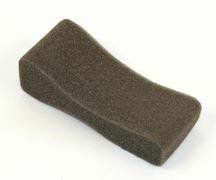 Basic economy foam pad provides excellent support and padding for beginning players. Made of comfortable open cell foam, and comes in three sizes to accommodate most sizes: 4/4-3/4, 3/4-1/2, and 1/4-1/8. Attaches to the instrument with rubber bands (not included).